Is the 'procedure' for aging gun parts identical to the featured descriptions or are there pitfalls?! Personally, I wouldn't age a firearm that I planned to shoot. Amateur chemical aging might (and I stress might before anyone here again complains of absolutes) weaken the metal and, considering the nature of both black powder and smokeless powder, just might cause failure during use. If I felt the need to have a firearm that looked a couple of hundred years old, I would turn to a professional gunsmith to do chemical aging. One of the great Foxfire books has instructions for a traditional DIY browning solution, but it involves "night soil"--not something most of us want to fool with when we can get browning in a bottle. I am with Jonathan on the subject of aging. If you are using it as a re-enactor, portraying someone who would have carried the gun as new, then there is no need to do so. If you do not reenact, but are planning to shoot the firearm, then there is no need to age it. However, all that being said, some tasteful aging may add to a reproduction firearm. I cannot do so now, but will try tonight to post some photos of a 17th c. Scottish rifle with metal parts that have been "aged" tastefully and appropriately. 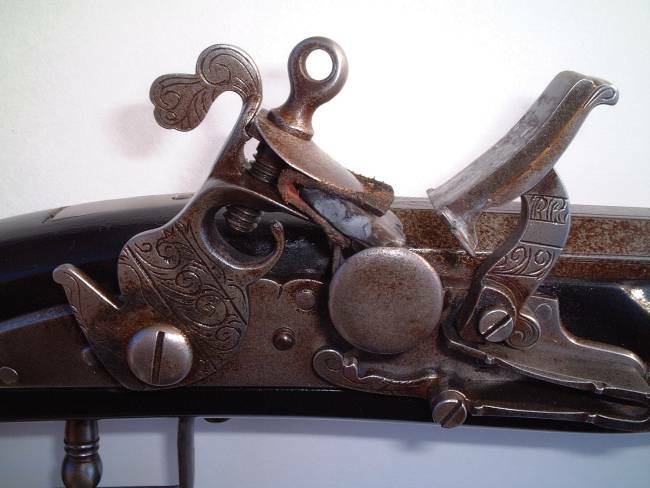 In this case the aging is appropriate, because the piece replicates a gun made in Scotland in 1650, taken to the Carolinas by one of its owners sometime thereafter, and which was later restocked by a gun maker who learned his trade in the French school of gun stocking. I think you will agree that in this case aging the metal was appropriate. I do not know how my gun was aged and really am not aware of what others use in the process. Aging does not necessarily mean creating rust or pitting, although that is a likely result of real aging. Wear on the stock and metal parts is also "aging". Some folks blue or brown the metal, then buff the higher points and edges to create the appearance of wear from use and handling. It is very important, if the decision is made to age the metal, that whatever is used is kept out of the barrel, breech threads and the internal workings of the lock, especially the springs. A couple of Italian manufacturers of cap and ball and cartridge revolvers from the 19th c. era have begun to offer artificially aged guns. A recent report in Gun Tests indicated that revolvers that had undergone the process had pitting in their barrels. This pitting, according to the testers, affected accuracy. I also know that pitting will create excessive "leading" of a barrel, when firing non-jacketed ammunition. As far as the wood goes, if using a gun as a re-enactor, ordinary handling and use will provide aging. My "newly restocked" Scottish rifle has already acquired a couple of dings just from being carried to Highland Games in the back of my SUV. However, again, there are makers who will distress the wood to some extent to provide the look of long use. I have one of those too, a Southern Mountain rifle built by Paul McCormick. The metal finish is somewhat rough, but not all as a result of aging, as these guns were not meticulously finished to start with. Paul did apply some light distressing in appropriate places on the stock and having owned and shot it for 14 years, I have also added a few dents myself. 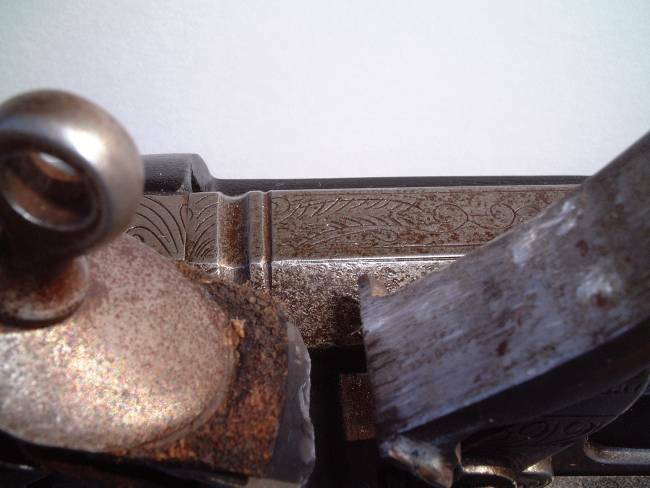 Wear on the finish at the gun's high spots around the lock and side plates, etc. give the effect of aging. Again, although it sounds like I am advocating aging, I am not. It is a matter of personal choice, but before doing any type of artificial aging I would give serious thought to what the gun will be used for and whether or not it is appropriate. I am not aiming for a gun looking hundreds of years old, nor will I roll it through the dirt on the driveway . It's just to get it not to look like it comes straight from its polystyrene packaging. Since I will 'treat' only the external mountings of the completely disassembled gun I am not worried about the mechanism as that will not be involved. You dó have a point as the hardening of the frizzen will, if ever so slightly, be influanced. Same thing the spring and the bearing surface of the frizen on the spring. Better to leave those alone. I am not worried about the strenght of the barrel's external white metal surface but I will need to seal it and protect the vent hole insert. I suspect no chemicals will be needed of the barrel anyway. A light rubbing with fine steelwool and wet-paper in soapy water will do I guess. The wood I intend to tackle with a darkish 'wash', then sand, polish and apply several oilings with buffing. However, all that being said, some tasteful aging may add to a reproduction firearm. ...even if just to remove the 'tacky' looking surface gleam form the too new copper yes. As I just mentioned I am not aiming for an 'antique' look. If you are planning to age brass fittings then I recommend Birchwood Casey Brass Black, if it is available in your area. It gets rid of the "new" look of brass right out of the package and is not unduly hard on the metal. Most brass tends to tarnish all over. Brass Black enables you to give the fittings that well-used look on the high spots along with the tarnish found in crevices and crannies. It gives a nice mellow look. Keep any and all chemicals off the face of the frizzen and the springs. As you mentioned, it definitely is not good for those parts. It won't necessarily affect the temper but you do not want corrosion in those locations. Good luck with your project. Please post photos when you are finished. Here are a couple of closeup photos of the rifle I mentioned. I did not take them to show off the aging, but it does show up well in the pictures. Look online for a Plum Brown finishing kit. That's a safe and traditional firearms finish. Thank you for the info and pictures. This 'brown' is way beyond what I mean as you will have understood so I guess I will be ok. I have the permit in hand now and paade by the regional gunshop which is quite near. It depends a bit on the proofing data supplied with the gun kit if I can get away with the shortening.